Kids will experience a new VBS curriculum together with engaged teachers and their peers while parents/caregivers are in their chosen sessions. Our team of teachers and leaders have completed background checks, and are ready to care for your kids through Bible lessons and activities. This VBS experience was designed by Warner Press especially for Convention 2019. 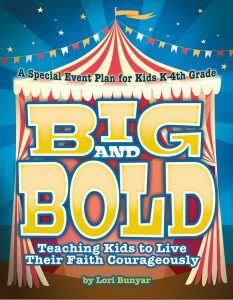 Big and Bold: Teaching Kids to Live Their Faith Courageously will welcome kids to a circus-like atmosphere they’re sure to love, and will feature such special guests as “David the Strong Man,” “Tangled Sisters Mary and Martha,” “Daniel the Lion-Tamer,” and “Jesus our Ringmaster.” Each morning during Convention 2019, a theme from these classic Bible stories—“Big and Bold Love,” “Big and Bold Peace,” “Big and Bold Goodness,” and “Big and Bold Faith,”—will come to life through wacky and wild activities, games, crafts, and lessons. Looking for a unique VBS or a four-week children’s experience for your church? Warner Press plans to make these resources available at Convention 2019 for the local church to take home. The Big and Bold curriculum book contains everything you need to know to create a fun, memorable, and educational ministry opportunity for kids. Advice and instruction are provided for decorations, snacks, and activities, along with complete lesson plans. These lessons will be spelled out step-by-step. Intro games or activities, the main lesson, review questions, craft ideas, and snack ideas will be provided for each day. Kids will have an opportunity to stay active in a safe and caring environment with play time, movies, and conversation while parents/caregivers are in the main evening session. Due to staffing and liability issues, we are not able to offer care for infants and preschoolers. The hotel does offer childcare for children age 4-12 at a per hour rate.